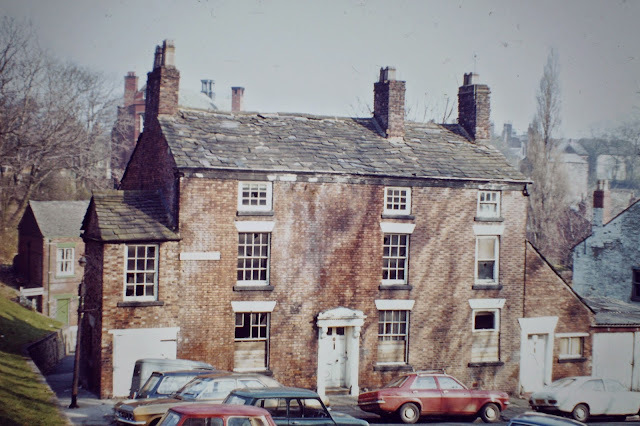 As previously discussed the Swan with Two Necks at 1-3 Hollinshead Street was only opened in 1980, named after its predecessor and neighbour, the Swan Hotel. 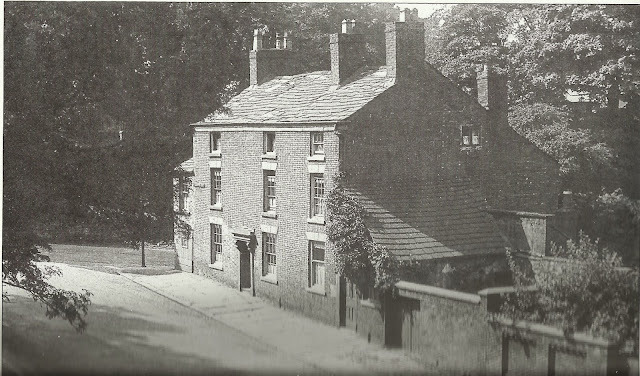 This pub opened following renovation of a listed Georgian building (shown above right) that had become derelict and was a popular town centre pub, which won a number of CAMRA accolades. 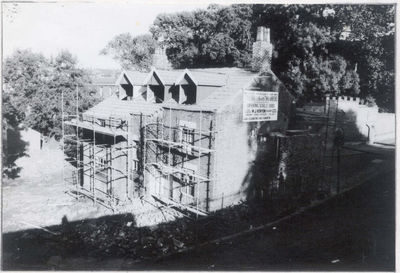 Below are a number of photos of the building taken before, during and after it's renovation from Edwardian residence to a bustling pub. 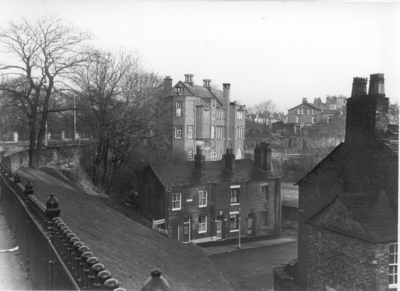 c.1970's the old Swan Hotel can still be seen on the right. c.1970's in a state of further disrepair. 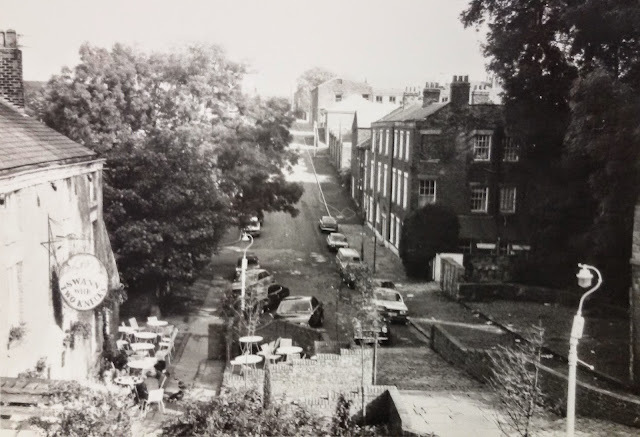 The picture taken above shows the pub in 1983, notice those good old Ford Cortinas and Minis outside! 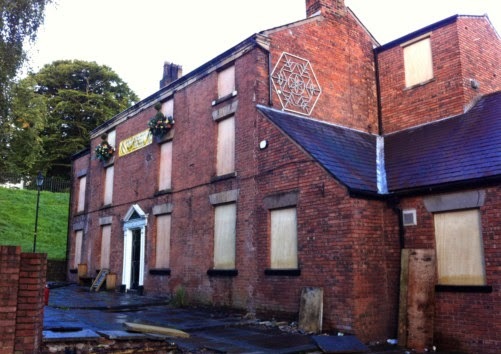 This is all that remains of one of Chorley’s most popular pubs after it was left ransacked. 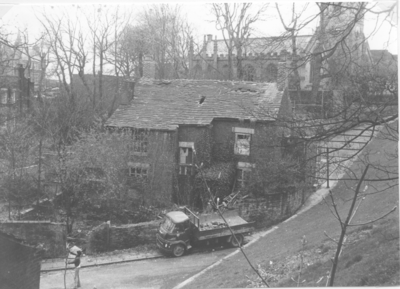 The Grade II-listed Swan with Two Necks is now barely recognisable, after timber decking outside the pub was ripped up, trees were cut down, and fixtures inside were taken out. 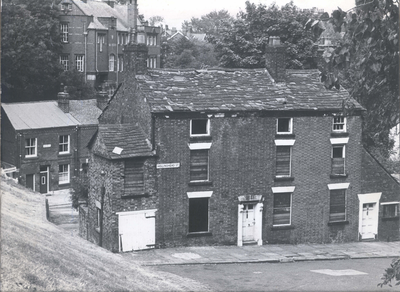 The landmark building on Hollinshead Street, in the St Laurence’s conservation area, was visited by council officers and the police last week. 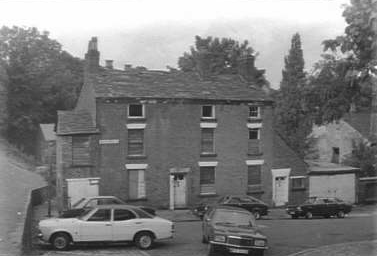 It was also visited by bailiffs on Thursday afternoon.At 3 pm that day, police were informed of a civil dispute raised by the building’s owner. Doors and windows have now been boarded up, and the building has been made secure. Two weeks ago, licensee Denise Hogan and her husband Nick announced they would be leaving the award-winning pub after eight years. In 2008 they completed a £160,000 refurbishment of the pub, which included creating new decking outside, laying solid oak flooring, installing designer light fixtures throughout the venue, and a roof terrace. The pub hit the headlines in 2010 when Mr Hogan became the first person to be jailed in connection with the smoking ban. He was sentenced to six months in prison for refusing to pay a fine, imposed by a judge, for more than £10,000 for flouting the legislation. The offences related to his time as landlord of The Swan with Two Necks and Barristers in Bradshawgate, Bolton. But a campaign was launched by his supporters, and his fines were paid. He was released 11 days into the sentence. The pub closed in 2010, with the smoking ban and cheap supermarket booze blamed for its demise. But in 2011 it reopened, with the Hogans saying they would give the business “one last go”. 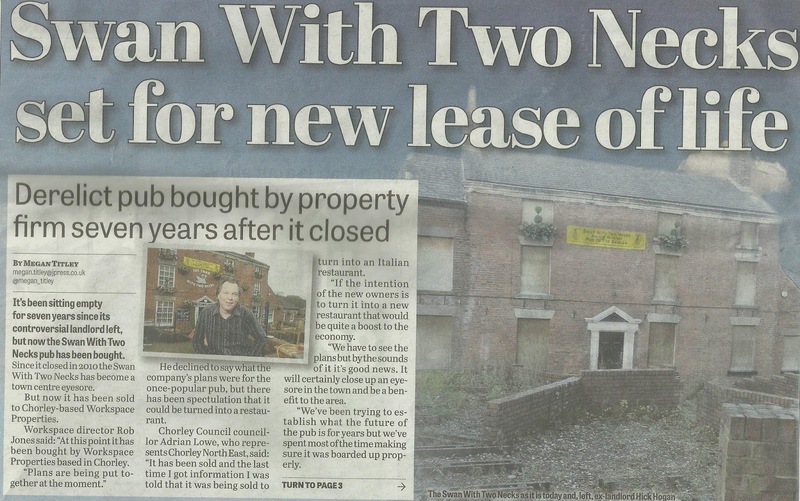 Punch Taverns, who previously leased the building, say they stopped leasing it 10 years ago. It is believed the owners of the pub now live in London. Lancashire Police confirmed they had been informed of the dispute, but said it is not being investigated as a criminal matter. 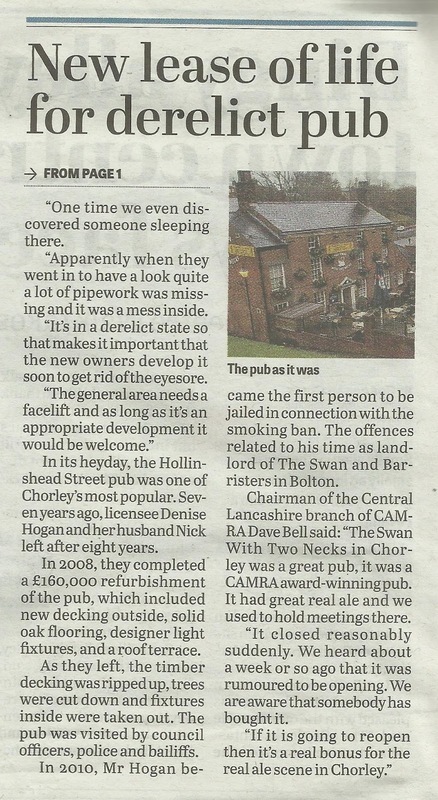 Mick Clark, a spokesman for the Central Lancashire Campaign for Real Ale, said: “So much damage has been done (inside the building) that it will be very difficult to bring it back into use as a pub, which is a real shame for Chorley. 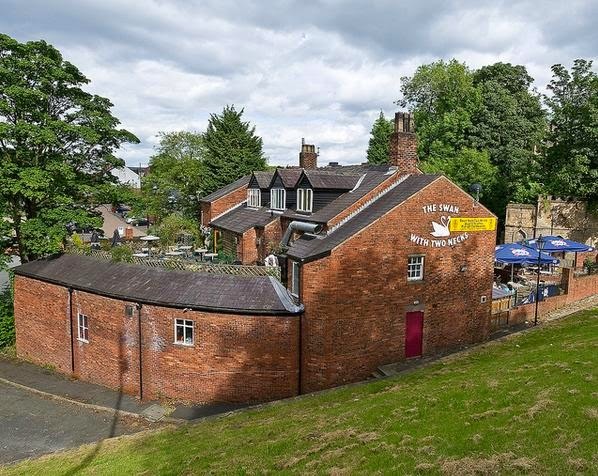 Large, award-winning red-brick pub at the bottom of a hill in one of Chorley's most attractive areas on the edge of the town centre. 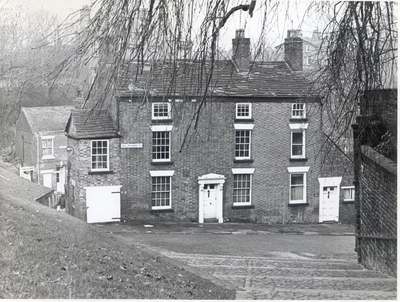 It lies down a flight of steps below the parish church, with handsome streets and period lamps. 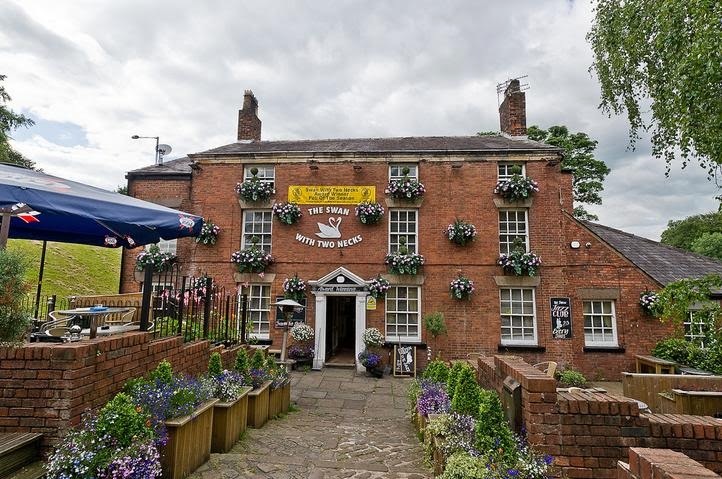 The main road north is at the side up a steep hill, whilst the very pleasant Astley Park and Hall are a stone's throw up the hill, so a good place to visit alongside this pub. It's a large place that meanders around a central bar, with several distinct drinking areas on different levels. On my visit only the top bar was open. Considering the surroundings and exterior, the interior was initially a bit of a disappointment, with a decidedly modern feel -polished wooden floor, minimalist decor, slightly garish purple seating and usual electronic gambling machines and jukebox. Also slightly loud piped music. After a while I warmed to it more- there is a snug to the left as you enter with a roaring real fire and a real pleasant atmosphere- full of locals. Also the main room in the top bar has various alcoves around a stove and some interesting sculptures. The bare brick walls in almost every area of the pub also add character. The pub also prides itself on its extensive and pleasant beer gardens both at the front and back of the pub. Onto the beer- the pub has a LocALE policy and a good selection of Lancashire microbrews were available on my visit. 3 Moorhouses beers-Pride of Pendle, Blond Witch and Black Cat- were complemented by Bank Top Flat Cap Bitter and Prosepct Silver Tally. Blond Witch was in fine form and a great pint even on a cold night. The pub does feature karaoke some nights and is renowned as a local entertainment venue, so if you're after a traditional pub and a quiet pint it probably won't be to your tastes (try the Prince of Wales). However all in all I enjoyed my visit here. It's a strong pub for beer and deserves its CAMRA awards. 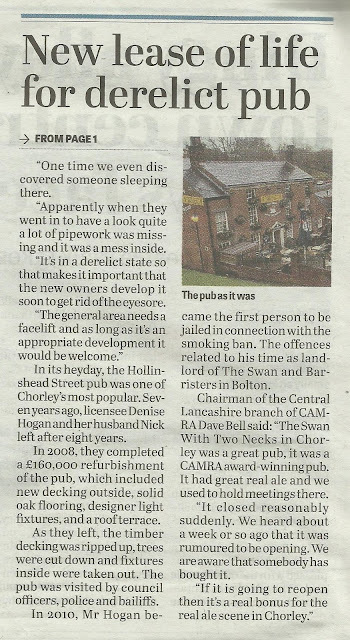 This free house is one of Chorley's gems & it's not a CAMRA pub of the season for nothing. At the front is a large enclosed patio area (with Umbrellas) which leads into the main bar itself. The pub was recently refurbished throughout & is tasteful, bright & comfortable. A previous upstairs bistro project has now made way for an exclusive wine bar, this is fabulous with lots of character & features an elevated patio area which on a sunny evenings is just wonderful. The downstairs bar (which leads of the main bar) doubles up as function room/night club on dedicated evenings. Overall this is a nice pub with lots of character & just far enough from the centre to deter the idiots. OK, if I have one minor observation, I do get the impression it is trying to offer something for everyone & in these hard time I can understand the financial pressures to do this. But in my experience it really doesn't work, inevitably it leads to customer conflicts of interest & this in itself is enough to put some people off. That said, I hope I'm wrong, as this lovable maverick landlord (Nick) his wife (Denise) continue to work hard to maintain this establishments well earned & enviable reputation as one, if not the best pub in Chorley. On the day of my visit (4/6/11), on tap where a Moorhouses~Pendle Witches Brew, Pride of Pendle, Blond Witch & Spring Fair & Bank Top~Flat Cap. Prospect~Silver Talley is due on. Oh, one final note, often it's the toilets that betray a pubs true identity, none of it here though, they were spotless & a credit to the owners, well done! My verdict? Well worth a visit, especially on a sunny day, it's just a few min's walk from the bus/train station. Recommended!